Many AR-15 owners find that the first upgrade they want to make to their rifle is a nice red dot sight. It’s a natural step up from a classic iron sight, because it provides a nice bump in accuracy and range without breaking the bank. As a result, these sweet little red dot sights are extremely popular. Here are three great options if you’re looking to make the upgrade from a standard iron sight. 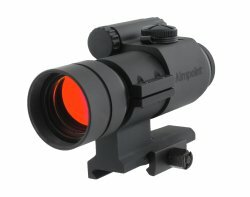 The optics company Bushnell should be familiar to any hunters out there. They are one of the best known optics manufacturers out there. Their Trophy TRS-25 Red Dot Sight is a great sight at an inexpensive price point. At less than $100 it’s worth the advantages it gives you over traditional iron sights. This sight is a tube design that weights in a 3.7 oz at a length of 2.4 inches, a slim design that won’t take up too much room on the rail. The TRS-25 has a 25mm objective lens that is coated in Bushnell’s patented Amber-Bright coating, providing high contrast between the FOV and the reticle. The reticle itself is a 3 MOA red dot which is a great size for close-to-mid range shots, good for target acquisition and speed. Sitting pretty towards the top of the budget price-range for red dot sights, the Vortex Optics SPARC II Red Dot (SPC-402) is a sight you’d be considering if you’re serious about your target-shooting or hunting exploits. In fact, for a sight that resides in this price bracket, you might even be surprised at just how close this sight comes to military-grade precision in its application.A longitudinal view of the Vortex Optics Sparc II might leave you wondering where the power and MOA adjustment buttons are, which are quite cleverly located facing backwards. In-use adjustment in this fashion might take some getting used to (you’ll be using your thumb more), but only if you’re used to sights with dials on the side of the device’s body. Aimpoint aims to add to its market share of red dot sights with the addition of their new Carbine Optic. The Carbine Optic is specifically designed for the Modern Sporting Rifle (MSR), and introduces a quality red dot sight to compete in the mid-level price range. The Aimpoint Carbine Optic combines the proven Aimpoint designs and features, and is ready to mount and shoot straight out of the box. The Carbine Optic will have a 30mm aluminum alloy sight tube with a fixed height mount designed to provide absolute co-witness with the chosen AR-15 back-up sights. Offered with a 2 MOA red dot, the Carbine Optic provides accurate targeting with maximum target acquisition. Typical of Aimpoint reliability, the Carbine Optic will be completely waterproof and offers a 1-year constant-on use from a single 1/3 N battery. Do you own a red dot sight for your AR-15? How do you like it? Is it one of the sights listed here? Give us your advice in the comments. I have an Aim Point Pro, and love it. The battery, left on on low, lasts for years. I also have an EOTech, which a good piece of equipment, but seems to drain the battery, even when not turned on. Between the two, hands down it’s the Aim Point Pro. I have a TRS-25 on my Sig 522 and it works fantastic. If you search “Palmyra Sportsman’s Association Rimfire Challenge 2012 Round 1”, you can watch a video of me competing with it. I can’t recommend it enough for it’s price and quality of use. what would be a good sight that would be appropriate for a Husgavarna 30-06 bolt action rifel? About the best that a red dot sight is going to do is quickly draw the eye to a target, but most of these red dot sights have a 2- or 3-MOA red dot — which can almost completely obscure your target, with or without magnification. You’re far better off using a Trijicon ACOG, as the Bindon Aiming Concept allows you to acquire and hit targets accurately, especially at ranges as far out as 600 meters with CQB speed without obscuring the target. I have two Bushnell TRS 25’s mounted on two Mini 14’s (223 Cal) and even though the #moa red dot covers the target at 250 yards, we can consistently knock down bowling pins at that distance. It is quick acquisition and the dot needn’t be centered in the scope to be accurate. The TRS-25 has not performed well for me at all. The recoil produced by my AK and my 12 gauge make the sight blink on and off. Also, it tend to pick up annoying ghost images from lights at the range, which suggests that the quality of its coatings is not all that great.